Discover the proven, market-leading text that is a favorite among students of all backgrounds for its clear, concise treatment of international trade and finance theory. Now in its 16th edition, INTERNATIONAL ECONOMICS uses a wealth of contemporary examples and practical applications to vividly demonstrate the relevance of the theory you are learning to real-world economic issues and policy questions. The author presents discussions, both verbally and graphically, making the text highly understandable even if you have little economics background. This edition reflects the latest economic issues, from deindustrialization and declining oil prices to foreign exchange market rigging and deflation and the Eurozone, keeping your instruction both current and interesting. You will soon discover, "If it's clear, concise, and contemporary, it has to be Carbaugh!" Known for his excellence in teaching, Dr. Robert J. Carbaugh is Professor of Economics at Central Washington University. He has been honored with numerous top teaching awards, including the 1984 Excellence in Teaching award at the University of Wisconsin, Eau Claire, and the Distinguished Professor of the University--Teaching award at Central Washington University in 1993. In 1996, Dr. Carbaugh was named Scholar of the Year by the Phi Kappa Phi Honorary Society at Central Washington University. In 2001, he received the Distinguished Professor of the University award for Research at Central Washington University. In 2004, Dr. Carbaugh was invited by the Directors of the Oxford Round Table to present a lecture, "Trade and Environmental Frictions in the Global Steel Industry," at Oxford University in England. 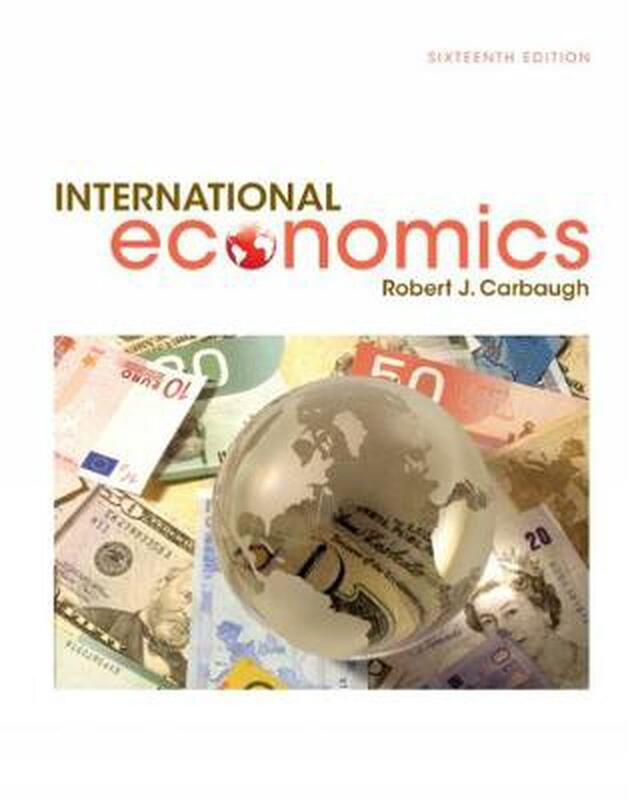 For more than 40 years, Dr. Carbaugh has taught international economics, as well as managerial economics, money and banking, and both introductory and intermediate levels of microeconomics and macroeconomics. The International Economy and Globalization. Part I: INTERNATIONAL TRADE RELATIONS. Foundations of Modern Trade Theory: Comparative Advantage. Trade Regulations and Industrial Policies. Trade Policies for the Developing Nations. International Factor Movements and Multinational Enterprises. Part II: INTERNATIONAL MONETARY RELATIONS. Exchange-Rate Adjustments and the Balance of Payments. Exchange-Rate Systems and Currency Crises. Macroeconomic Policy in an Open Economy. International Banking: Reserves, Debt, and Risk. Glossary. Index.